March 13, 2015: Steve gets a return call from Howard Stark. 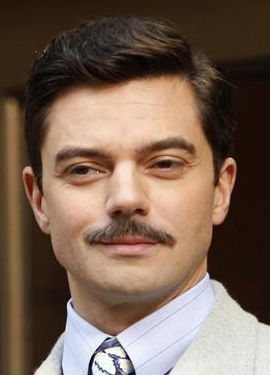 It's taken awhile for the paperwork to come through that allowed Howard Stark to hold a passport once again. By all accounts, he was off to the airport almost as soon as it was in-hand. No one knows exactly where he's gone, except for vague references to escaping winter. Seeing as he has no right-hand man (or woman, or robot) to pump for information, he's quite neatly off the grid. It's certainly not unusual for the Starks to be incommunicado. They work on their own schedule. That's just a reality. If Howard doesn't want to be cornered, he's not going to be cornered. However, there are always exceptions, and his is Captain America. So, Cap's phone rings. The number isn't familiar and it's got a strange series of digits that's the hallmark of a call coming in from a foreign country. Steve is heading northbound on I-95, returning to New York City from the south. He's in the middle of Jersey, but when his phone rings, he pulls over to the next exit after turning the phone on and quickly pulls off the road before shutting down the bike. The result is a bit of a gap between where it rings and when Steve's voice comes through the receiver. "This is Captain Rogers," he says. "Steve, it's Howard," says the voice on the other end. There's a bit of racket from the other side of the phone, but of the decidedly non-North American variety. Words are shouted in other languages and there are strains of music that is distinctly not Top 40. "I got a message that you wanted to speak to me." "Yeah, listen. A few nights ago Fitz, Simmons, and I were trying to get to the bottom of some sort of energy that keeps popping up all over the place. There was a being, who we think came from some sort of rift. I don't even know if what I'm saying makes sense. Anyways, this being that came through, it had a watch that I think you gave to Peggy." Steve takes a breath before adding, "I went down to check her out, and she's fine. Do you remember anything about that watch?" The silence on the other end after that is conspicuous. The connection hasn't been cut off because Steve can still hear the boisterous sounds of what seems to be some kind of market. People shout in primarily Arabic and French. After a long moment, Howard finally speaks. "Yeah. She lost that watch on one of our first missions after we formed SHIELD." "She'd said as much. I asked her after I called you. I had an agent check on her, but I had to see for myself. I guess whoever or whatever this thing was happened upon it somehow." Steve's turn to return the silence before he adds, "Just be careful out there, Howard. I don't know who this is or what they have to do with you or Peg, but just be careful." "Steve…" there's hesitation in Howard's voice. "I can't get into the details, but trust me, I'm not in any danger. And neither is Peggy." There's the sound of shifting, perhaps as he puts the phone in his other hand. "Look, I'll be back in New York in a couple of days." "What do you mean you can't get into the details? Your fingerprints are all over this, Stark. You need to level with me here." "It's classified. It's the first Level 10 in SHIELD history." Howard exhales slowly. "I know you don't like that answer, but that's my answer. You're going to have to trust me. I'll handle this when I get back in the country. In the meantime, have the techs locked in on the frequency of the rifts yet?" "Well if you won't talk to me, you'll talk to Fury, damnit." Steve promptly hangs up on Howard without answering his question. "He can take level 10 and shove it," he says under his breath. He looks out over the interstate and changes his mind. He was going to drive home, but he's going to be driving straight to the Triskelion. A few minutes later, Steve's phone makes whatever sound it makes when he receives an email. There's no text other than a frequency and a scanner model number, and Howard's standard email signature.